Candidate should have minimum 10 to15 years of relevant work experience with keen business acumen and an entrepreneurial spirit to independently carry out company's business objective in the market. As RSM he / she should be able to study market trends and derive business strategy in order to meet the current Indian market requirements and develop strategies for its future potential. Candidate must have sound understanding of commercial vehicle industry, transport applications and customer needs / expectations. Good people management skills and customer focus is must. Candidate should have minimum 6 to 10 years of relevant work experience with keen business acumen and an entrepreneurial spirit to independently carry out company's business objective in the market. Candidate must also have sound understanding of commercial vehicle industry, transport applications and customer needs. Candidate with exposure to Key Account Management & Direct customer handling experience would be given preference. BE (Mechanical), preferably with an MBA degree in International Business. Candidate should have 7 to 12 years of relevant work experience in the automobile / bus industry and good understanding of International Business and be able to independently conduct business development & sales for the SAARC region. Monitor market trends & develop business strategies in order meet business objectives and customer service standards, liaison with the government agencies with the objective of meeting sales target for the defined region within the overall business strategy and plan. I le / She should have good customer management and dealership management skills. Candidate should have 7 to 10 years of relevant work experience in the automobile industry and good understanding in the area of export and logistics. He / She is able to independently handle all activities related to export logistics, from inbound documentation and clearing export related material to outbound distribution and shipping of buses for export. This position is related to logistical activities for all export units. Candidate should also be able to liaison with DGFT, Insurance Companies, Shipping Companies, CHA3 and Payment Authorities and build a strong network with above mentioned agencies. BE (Mechanical / Automobile Engineering). MBA is desirable Candidate should have 8 to!2 years of work experience with a minimum of 3 to 5 years of After-Market Sales in the automobile industry. He / She should have sound techno - commercial knowledge of commercial vehicles, transport industry, transport applications and be able to develop, support and enhance after-market business. 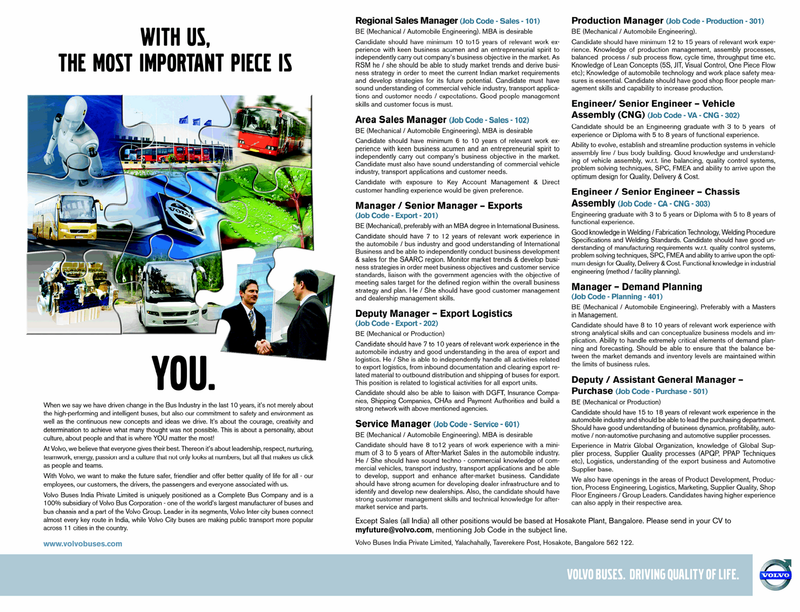 Candidate should have strong acumen for developing dealer infrastructure and to identify and develop new dealerships. Also, the candidate should have strong customer management skills and technical knowledge for aftermarket service and parts. Candidate should have minimum 12 to 15 years of relevant work experience. Knowledge of production management, assembly processes, balanced process / sub process flow, cycle time, throughput time etc. Knowledge of Lean Concepts (5S, JIT, Visual Control, One Piece Flow etc); Knowledge of automobile technology and work place safety measures is essential. Candidate should have good shop floor people management skills and capability to increase production. Candidate should be an Engineering graduate with 3 to 8 years of experience or Diploma with 5 to 8 years of functional experience. Ability to evolve, establish and streamline production systems in vehicle assembly line / bus body building. Guud knowledge and understanding of vehicle assembly, w.r.t. line balancing, quality control systems, problem solving techniques, SPC, FMEA and ability to arrive upon the optimum design for Quality. Delivery & Cost. Engineering graduate with 3 to 5 years or Diploma with 5 to 8 years of functional experience. Good knowledge in Welding / Fabrication Technology, Welding Procedure. Specifications and Welding Standards. Candidate should have good understanding of manufacturing requirements w.r.t. quality control systems, problem solving techniques, SPC, FMEA and ability to arrive upon the optimum design for Quality, Delivery & Cost. Functional knowledge in industrial engineering (method / facility planning). BE (Mechanical / Automobile Engineering). Preferably with a Masters in Management. Candidate should have 8 to 10 years of relevant work experience with strong analytical skills and can conceptualize business models and implication. Ability to handle extremely critical elements of demand planning and forecasting. Should be able to ensure that the balance be- tween the market demands and inventory levels are maintained within the limits of business rules. etc), Logistics, understanding of the export business and Automotive Supplier base. myfuture@volvo.com, mentioning Job Code in the subject line. Volvo Buses India Private Limited, Yalachahally, Taverekere Post, Hosakote, Bangalore 562 122.